One of the reasons attacks on Donald Trump such as National Review’s recent symposium have been ineffective is because they don’t speak to the factors that could actually change his supporters’ minds. Among Trump fans who read conservative commentary, The Donald’s various political heresies, temperamental deficiencies, and personal failings are already priced into their decision—they aren’t prioritizing a full-spectrum conservative, they just want someone who’ll finally shut the border and get our immigration system under control once and for all, and don’t trust anyone else to do it. So don’t waste space reiterating what they already know and don’t care about. Instead, focus the bulk of your energy dismantling the only good pro-Trump argument—his perceived strength as an immigration hawk—and publicize the truth that, beyond the tough talk about building walls and deporting rapists, he’s as wobbly and inconsistent on the issue as anyone. Several media reports allege that Trump knowingly employed illegals on construction projects. Trump denies it, but putting self-interest above principle would hardly be above a man who defends to this day making political contributions “to everybody” explicitly on the basis that they’ll owe him favors. Following the 2012 election, Trump blamed Mitt Romney’s loss in part on his “crazy policy of self deportation which was maniacal,” and the broader sense that Republicans were “mean-spirited about” immigration. Instead, he urged the GOP “to take care of this incredible problem that we have with respect to immigration, with respect to people wanting to be wonderful productive citizens of this country.” The Wall Street Journal couldn’t have said it better themselves. In 2013, during the battle over Marco Rubio’s atrocious Gang of 8 amnesty bill, Trump tweeted, “Congress must protect our borders first. Amnesty should be done only if the border is secure and illegal immigration has stopped”—parroting the GOP conventional wisdom that amnesty is fine as long as we beef up enforcement first. 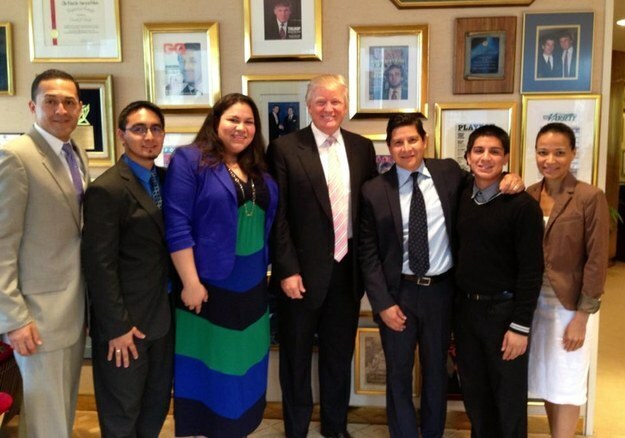 Also in 2013, Trump hosted a meeting with a group of DREAM Act activists, which they claim ended with Trump telling them, “You’ve convinced me.” Even if we assume they’re lying about that quote, it is uncontested that Trump posed for a photo op (above) with the very people we’re now meant to believe he would stand against. In July, Trump parroted the open-border crowd’s premise that there are “jobs that a citizen of the United States doesn’t want to do,” as well as endorsed expedited legalization for DREAMers (guess they convinced him after all!). For all the attention Trump’s gotten for promising to deport illegals by the millions, Trump’s actual proposal is amnesty. Touchback amnesty, to be specific—“I would get people out and then have an expedited way of getting them back into the country so they can be legal.” His son Eric has even complained that his dad’s not getting more credit for “letting them back in legally.” Mass deportations are a massive waste if the end result is winding up back where we started. Just before the Iowa primary vote, Trump said, “you know, if it gets a little boring, if I see people starting to sort of, maybe thinking about leaving, I can sort of tell the audience, I just say, ‘We will build the wall!’ and they go nuts.” Because we didn’t have quite enough reasons to doubt his sincerity. In February, word came out that Trump allegedly admitted to the New York Times that his tough immigration talk was nothing more than a bargaining gambit that would inevitably get watered down in congressional negotiations—a charge he doesn’t deny. If you think immigration would be uniquely exempt from all of that, think again—which is the message a competent anti-Trump campaign would devote the lion’s share of its energy to hammering home.